Elwa, Tukhm Soya, Turbud Safaid, Habb-ul-Neel, Suranjan Shirin, Gugal, Mastagi. 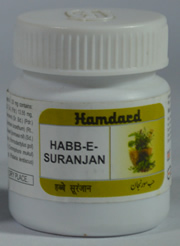 It is used in the treatment of joint & rheumatic pains and removes constipation. 1–2 Tablet to be taken twice daily.